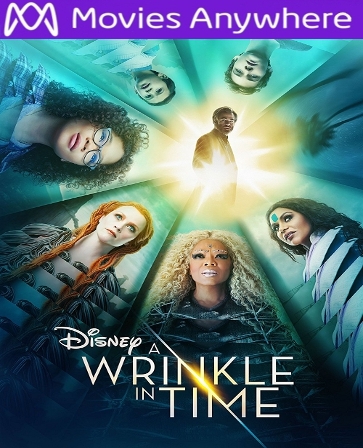 Digital UltraViolet and Digital Copy will makes it possible for you to stream the movie A Wrinkle in Time HD UV or iTunes Code Via MA instantly to your computer and compatible Smartphones, Andriod, iphone, iPod Touch, iPad and tablets devices anytime, anywhere. You can also download a Digital UltraViolet Copy or a Digital Copy of the movie A Wrinkle in Time HD UV or iTunes Code Via MA to your computer and compatible devices. From visionary director Ava DuVernay comes Disneys A Wrinkle In Time. Based on the timeless classic and filled with spectacle, warmth and heart, this celebrated film follows an ordinary girls epic adventure and brave journey home, with the ultimate triumph of love. Featuring an all-star cast including Oprah Winfrey, Reese Witherspoon, Mindy Kaling and Chris Pine, and eye-popping actionits fun for the whole family!